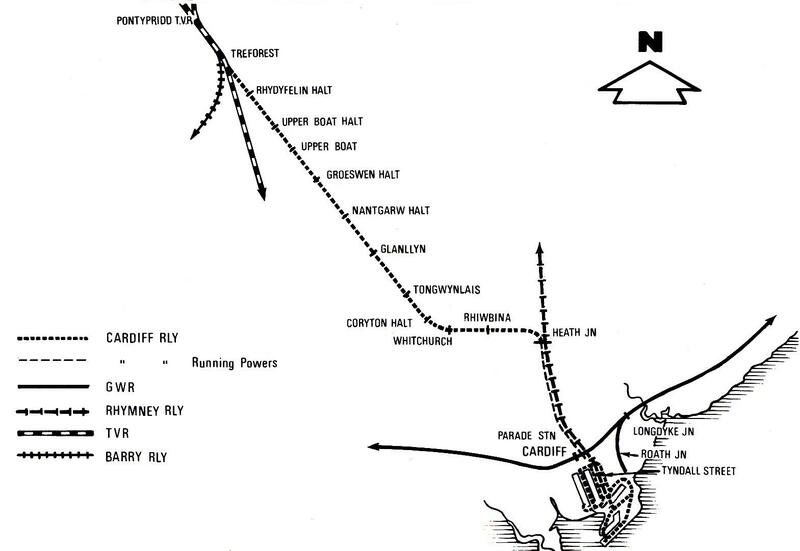 The Cardiff Railway came into being from the need to service Bute Docks, so as to provide facilities for the coal traffic to and from the Docks. On 6 August 1897 the Bute Docks Company became the Cardiff Railway Company. All its attempts to promote various railways were opposed and defeated except for an 11 mile line between Treforest on the Taff Vale Railway crossed over the Glamorgan Canal to connect with the Rhymney Railway at Heath Junction three miles north of Cardiff, and then by means of running powers reached its own dock railway. This railway opened on 15th May 1909, one special train, hauled by a Cardiff Railway locomotive ran from the Bute Merthyr Collieries at Treherbert with the Marquis of Bute on the footplate. The train passed over a temporary junction at Treforest and continued down the Cardiff Railway. Unfortunately the Cardiff Railway's Act only authorised a junction with the passenger lines of the TVR at Treforest. Attempts to overturn this were successfully defeated by the TVR on the grounds of safety and the geographical limitations at the point of the junction. The main line was restricted to few local goods trains, and a railmotor service from Rhydyfelin Halt running to the Cardiff Parade station of the Rhymney Railway. In 1909/10 the TVR promoted a bill to absorb the Cardiff and Rhymney Railway, the bill was defeated due to opposition from the Barry Railway and because the government of the day was reluctant to create monopolies. Ultimately the Cardiff was forced to acknowledge that it would never be a successful company in its own right, but remained independent until the Railways Act 1921, when it became a constituent part of the Great Western Railway on 1 January 1922. The Cardiff Railway. Mountford, Eric. Oakwood Press, 1987. ISBN 0853613478. Railway Magazine, 1908. Railway Ports – Bute Docks Cardiff Railway.